Tiny particles of pure gold (91.6%) are blended with 8.4% fine silver particles to create a precious metal with deep yellow color and the ability to fuse to silver at relatively low temperatures. The result is a layer of gold that is considerably thicker than possible with electroplating. Aura 22 is ideally suited to work with all versions of PMC and metal clay. It can also be used on wrought fine silver and, with care, on sterling that has been properly prepared (see be low). Unlike electroplating, Aura 22 requires no special equipment. Because it can be painted on, Aura 22 offers gestural responses unlike any other gold layering process. It is especially recommended for heavily textured surfaces, and for embellishing areas that would be difficult to cover with alternative techniques. Aura 22 involves almost no waste and a relatively small investment. A one gram package can usually embellish 20-30 objects. The proper consistency of the material is a creamy paste that spreads like nail polish. Each package comes with a bottle of Media, which can be used to refresh the Aura22 if it dries. Add a drop or two, allow to sit for a few minutes, then stir. Use a scribe, a large sewing needle, or similar smooth tools-extra Aura22 can be easily wiped off and returned to the container. The surface of the metal should be cean and dry. No other special preparation is necessary. Apply an even layer of Aura 22 with a scribe, paintbrush, or rubber tipped tool. Uneven thickness will show up as different shades of gold. Two layers are usually sufficient, but three layers will guarantee a rich, pure gold color. Allow the Aura 22 to dry, completely between layers, usually 20-30 minutes. Do not force the drying (for instance with a hair dryer) be cause this hardens the outer surface and traps moisture inside. There is no problem with allowing the Aura 22 layer to wait several days before fusing. Set the dried work onto a soldering pad and heat it slowly until the silver glows with a radiant red color. When this color appears, the fusing occurs instantly. Metalsmith will recognize this as the color just beyond the flow point of hard solder. Use a normal firing sequence, with 30 grams of gel fuel. Polish the Aura 22 layer by hand burnishing, brass brushing, rubbing with fine steel wool, or tumbling. At this point the work can be soldered, enameled, and colored following usual procedures. Aura 22 contains a binder that burns off during the fusing process. The gases released are not toxic, but we recommend that you do not inhale them. Do not lean directly over the work during fusing. 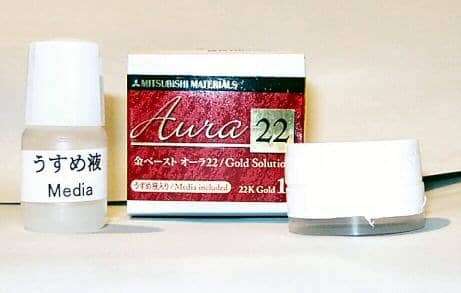 If media gets on your skin or in your eyes, rinse well with water.Preparing SterlingAura 22 works best on fine silver, but it can be used on sterling. Prepare the object by creating a layer of fine silver on sterling by depletion gilding. Heat the piece until it oxidizes to a dark gray, then quench it in jeweler's pickle. Rinse in water and repeat the process at least six times. You can apply Aura 22 now or, even better, paint on a layer of PMC Paste (any version). Al low this to dry, then paint the Aura 22 onto this layer. Fusing and finishing follows the steps described above.